Archaeologists have made the first three-dimensional topographical map of ancient monumental buildings long buried under centuries of jungle at the Maya site "Head of Stone" in Guatemala. The map puts into 3-D perspective the location and size of Head of Stone's many buildings and architectural patterns, which are typical of Maya sites: 70-foot-tall "triadic pyramid," an astronomical observatory, a ritual ball court, numerous plazas and also residential mounds that would have been the homes of elites and commoners, according to archaeologist Brigitte Kovacevich, Southern Methodist University, Dallas. The buildings date from 800 B.C. to 900 A.D., says Kovacevich, an expert in Meso-American cultures and co-leader of an international scientific team that has been granted permission by the Guatemalan government to work the site, which has never before been excavated. Known for its far-reaching state-level government, Maya civilization during the "Classic" period from 200 A.D. to 900 A.D. consisted of huge monumental cities with tens of thousands of people ruled by powerful kings, palaces, pyramidal temples and complex political and economic alliances, Kovacevich says. In contrast, "Head of Stone," called "Holtun" in Maya, is a modest site from the "Pre-Classic" period, 600 B.C. to 250 A.D., she says. The small city had no more than 2,000 people at its peak. Situated about 35 kilometers south of Tikal, "Head of Stone" in its heyday preceded the celebrated vast city-states and kingship culture for which the Maya are known. By excavating a small city, Kovacevich says, the archaeologists hope to understand early Maya trade routes and alliances, the importance of ritual for developing political power, how political power emerged, and how kingship lines evolved and solidified. "There is a movement toward a greater understanding of these early periods, with smaller sites and common people," says Kovacevich, an assistant professor in SMU's Anthropology Department. "Little is known about how kingship developed, how individuals grabbed political power within the society, how the state-level society evolved and why it then was followed by a mini-collapse between 100 A.D. and 250 A.D."
Kovacevich presented "'Head of Stone': Archaeological Investigation at the Maya Site of Holtun, Guatemala" during the 76th annual meeting of the Society for American Archaeology in Sacramento, Calif., March 30 to April 3. Besides Kovacevich, archaeologists on the team and co-authors of the paper are Michael G. Callaghan, University of Texas at Arlington; Patricia R. Castillo, Universidad San Carlos, Guatemala; and Rodrigo Guzman, Universidad del Valle, Guatemala. 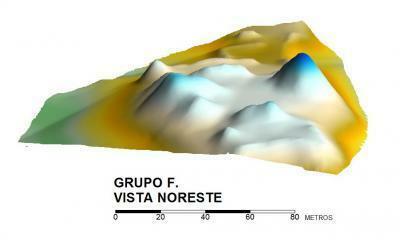 The 3-D topographic map expands surveys from 1995 and 2002 by Guatemalan archaeologist Vilma Fialko and Guatemala's Institute of Anthropology and History, which were documented by Fialko and archaeologist Erick M. Ponciano. Head of Stone today sits in a patch of rainforest surrounded by cow pastures and cornfields on a limestone escarpment, which would have made it highly defensible, Kovacevich says. Holtun's structures — more than 100 of them — now are overgrown with a thin layer of centuries-old jungle foliage and soil. The site is about one kilometer long and half a kilometer wide, or almost three-quarters of a mile long and one-third of a mile wide. The large mounds protruding here and there from the jungle floor signal to archaeologists the familiar building arrangements customary at a Maya site, Kovacevich says. The 3-D mapping has confirmed an "E Group," a key Maya architectural structure. Holtun's "E Group" dates from 600 B.C. to 600 A.D. and consists of stair-step pyramids and elongated buildings that likely served as astronomical observatories central to Maya rituals. A stepped pyramid to the west of a long narrow building directly oriented north-south served as the observational structure and was related to veneration of sacred ancestors, Kovacevich says. "From the observational structure you can see the sun rising at the different solstices throughout the year, which is very important agriculturally, to know the timing of the seasons and when to plant and when to harvest," she says. "So the people creating this are harnessing that knowledge to show their followers and constituents that they possibly are even controlling the change of seasons." Adjacent to the "E Group" are four structures that face one another around a central patio. The pattern usually indicates a residential group, where cooking and food processing were carried out on the patio, Kovacevich says. "The closeness of the residential structure to the "E Group" suggests these were very early elites, and possibly kings," she says. "Kingship was just being established during this period." Triadic pyramid represents Maya mythology? Besides the "E Group," a triadic pyramid dating from 300 B.C. to 300 A.D. sits at the north end of the site. As is typical at Maya sites, three pyramids about 10 feet tall sit atop a high platform that rises about 60 feet from the jungle floor, Kovacevich says. One of the pyramids faces south, flanked on either side by the other two, which face inward around a central patio. The platform sits atop — and obscures — an earlier sub-structure platform, buried underground and decorated with monumental masks that are visible from the looters' tunnels. During the Classic period, kings were typically buried in Maya pyramids. During the Pre-Classic period, however, that isn't the case and they were typically buried in their residence. It's possible an early king of Holtun was buried in one of the residential structures, Kovacevich says. "Ancestors are buried beneath the floor and kept very close and venerated," she says. "The more ancestors a residence has, the more times the family redoes their floor, making a new floor, and so their mound gets higher and higher. A person with more ties, more ancestors, has more status." Another familiar structure is a ball court, signified by two long mounds that are exactly parallel, said Kovacevich. The team's Holtun excavation is scheduled to start this summer. Funding is from the Institute for the Study of Earth and Man, the Downey Family Fund for Faculty Excellence and SMU.